What do General Curtis LeMay, Arthur Godfrey, Herbert Hoover, Arthur Collins all have in common? They were Ham radio operators. 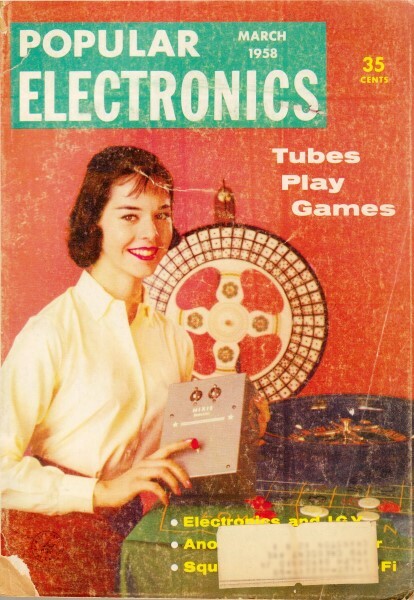 A lot of famous people were/are Hams, with these and a few other notables mentioned in this March 1958 edition of Popular Electronics. Conspicuously missing is one of modern day's most renowned Hams, and that's Walter Cronkite, KB2GSD (died in 2009). His broadcast career stretched back to World War II, so he was definitely around long enough. Maybe the author just didn't know; after all, he couldn't just look it up on the Internet or in an FCC computer database. Installing some new radio transmitting equipment at an Army base in Cyprus after World War II, Staff Sgt. Pappy Henderson found himself short of several badly needed parts. One evening, while working his ham radio "rig," he sent out a CQ and hooked up with D4AFE in Wiesbaden, Germany. Since this was the location of theater headquarters, Pappy asked the other ham if he knew any "brass" who could pry loose his urgent request for supplies. D4AFE did considerably better than that - the material was aboard a plane for Cyprus the same day. What Pappy didn't know was that D4AFE was the then Lt. General Curtis LeMay, Commander of the U.S. Army Air Forces in Europe! Like many prominent men with eight-ulcer jobs, General LeMay, now four-star Vice Chief of Staff of the Air Force, finds needed relaxation through informal radio chats with "neighbors" - perhaps thousands of miles away - through the twentieth-century magic of amateur radio. 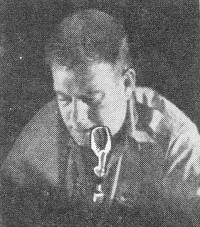 One of LeMay's close friends is also an amateur radioman, who got his start as a Navy radio operator. Later he turned to the field of radio entertainment, and built up quite a reputation. Radio amateurs know him as K4LIB; you know him as CBS network star Arthur Godfrey. Even though Godfrey spends many hours each week using radio and TV professionally, he finds amateur radio a relaxing and enjoyable hobby. When he went on a hunting trip to Africa with LeMay last year, they brought along some ham radio gear and kept in touch with the folks in Virginia. Profitable Hobby. Amateur radio is one of the few fields in which you can be a professional without altering your status as an amateur. A very democratic fraternity - Godfrey and LeMay are known to hundreds of fellow-hams by their first names - America's 160,000 FCC-licensed amateurs come from all walks of life, all ages, all races and creeds, drawn by the attractions of this scientific, many-sided hobby. Some enjoy building equipment, trying out all sorts of circuits and ideas. For others, tinkering as amateurs has led to profitable and enjoy­able careers. Arthur Collins, for instance, first built ham rigs for himself. 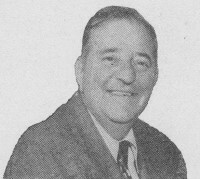 When other hams became interested in his designs, he formed the Collins Radio Co. and started producing amateur equipment commercially in the 1930's. Today, still a ham (W0CXX), and still producing top-grade ham gear, he heads one of the largest companies making aircraft radio equipment for the airlines and the military. Another company well known to amateurs and short-wave listeners - Hallicrafters - was founded by amateur William J. Halligan, W9AC. Gilbert Gustafson's hobby, too, has led to a solid career: he is a vice-president of Zenith, in charge of engineering for the huge radio-TV manufacturing concern, while still hamming with the call W9AQS. You don't have to be rich, famous, or an engineer to become a ham. There's no age limit, at either end of life, and there's no charge for the licenses which are issued by the FCC to those who have qualified. Children as young as six have passed the Novice Class examination; one old gent is still hamming at 92. You can take your studying in easy stages, with actual on-the-air practice in between. The Novice exam requires only an International Morse Code speed of five words a minute - sending and receiving - and a simple written test mainly concerned with FCC rules governing amateur operation. This license is good for a year, and allows low-power operation in four amateur bands, including one band for voice conversations and three for code. From this license, you can go on to one that's tougher technically but that doesn't require any increase in code speed. This is called the Technician license, and permits operation in most of the very-high-frequency bands. It is becoming very popular, especially in the larger cities and metropolitan areas. A Technician license is good for five years, and can be renewed easily. 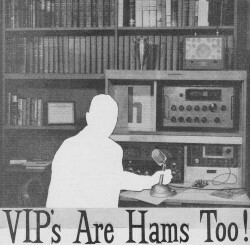 The goal of most hams is possession of a General Class license, requiring 13 words per minute in code, and a fairly thorough (though not too tough) exam in radio theory as well as regulations. The General Class amateur can operate "phone" (as hams call voice), code, or radioteletype in every authorized amateur band, and can even operate TV and facsimile in some bands. This license, too, is good for five years and is renewable. You can either build or buy your equipment. Most hams buy receivers already assembled and tested, because proper checking of a complicated communications receiver usually takes a fair amount of skill and considerable equipment. Some hams build transmitters from scratch, either with a design of their own or one which has appeared in a magazine or technical book. Others buy kits containing the necessary parts, punched chassis, cabinets, knobs, tubes and all, and build their transmitters according to detailed instruction books furnished with the kits. Still others prefer to buy their transmitters wired, tested and ready to plug into the wall. Adequate transmitting and receiving antennas can be made from wire even by inexperienced people. Later on, you might want a more complicated directional antenna shaped like those used for TV but usually quite a bit larger; there are several types available from many different manufacturers. Dr. Allen B. Du Mont, TV pioneer and head of Du Mont Labs., and Ross D. Siragusa, president of Admiral Corp., while no longer hams, got their start in this hobby. Two well-known scientists, E. Finley Carter, director of the Stanford Research Institute, and Cyril J. Staud, vice-president for research of Eastman-Kodak, are long-time amateurs, with the calls K6GT and K2DQ respectively. Amateur radio is a proving ground for new ideas. 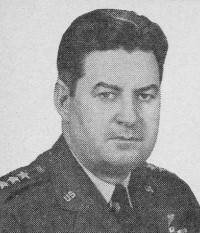 Lt. General Francis H. Griswold, deputy chief of the Strategic Air Command, was quite impressed with the compact yet highly effective "single-sideband" equipment used by amateurs. A ham radio operator himself, Griswold averted the delays which would have been inevitable through professional and military tests and evaluation of the new system - he installed amateur sideband gear in several SAC aircraft and found he could maintain two-way contact with amateurs all over the world while the huge bombers were navigating the globe. Its practicality and efficiency thus quickly proved, the new sideband form of voice transmission has now become the standard for military aircraft. A set of four useful booklets called the "Gateway to Amateur Radio" is published by the American Radio Relay League, which provides technical books and booklets at reasonable cost to amateurs and would-be amateurs. Included in the set is the "Radio Amateur's License Manual," which contains the full text of the FCC regulations, sample questions and answers, information on where to obtain application blanks and exam papers, and other useful material. A second booklet, "How to Become a Radio Amateur," shows you how to build simple transmitters and receivers, and explains in simple terms what makes radio work. The third one, "Learning the Radiotelegraph Code," not only tells you how to learn the code, but includes practice material and suggestions for constructing buzzers or oscillators so that you can send the code. The remaining booklet, "Operating an Amateur Radio Station," explains many of the "Q-signals," abbreviations and jargon that hams use, and in addition, describes the ARRL and its services. The "Gateway to Amateur Radio" can be obtained in most radio parts stores, or you can write Department P, American Radio Relay League, 38 La Salle Rd., West Hartford 7, Conn., for further information. Specialized Hams. But this hobby is not reserved for engineers and engineers-to-be. Its other facets are appealing to people with little scientific or mechanical bent. There are the "DX hounds," those who try to hold chats with amateurs in as many different countries, possessions and territories as possible. There are "traffic men," who meet on the air regularly in networks to relay messages for other amateurs and the general public, free of charge. There are contest fans, who delight in the fast and snappy operating to be found in numerous contests sponsored by the hams' national organization - the American Radio Relay League, foreign societies, and local clubs throughout the country. And there are the hams who specialize in emergency preparedness; through regular drills on the air, they maintain a vast network ready to go into operation whenever floods, fires, hurricanes, storms, or other disasters disrupt normal communications facilities. Perhaps the largest group - and one which attracts virtually all hams at one time or another - is called the "rag-chewers." These friendly folk like to make new friends by radio, chatting at length about all sorts of things. From All Walks of Life. Back in 1928, two California hams met by radio and were enjoying a rag-chew. One of them, a Democrat, talked at some length about the virtues of Alfred Smith, who was running for president that year against Herbert Hoover. The other ham didn't seem to have too much to say, and soon signed off. The first wondered a little, then picked up his ham directory to address the usual QSL (acknowledgment) card. The amateur at the other end of his campaign talk turned out to be Herbert Hoover Jr.! 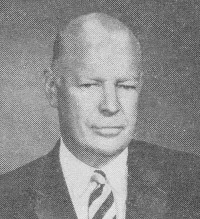 The younger Hoover, now rather well known himself as a petroleum engineer, as a trouble-shooter for the State Department, and as Under Secretary of State from 1954 through 1957, has ham stations at both his home in Pasadena (W6ZH) and his summer home in Santa Barbara (K6EV). In the field of music, there's Tex Beneke, who took over the Glenn Miller orchestra after the death of its renowned leader. He and his wife Marguerite have both been hams for several years; now living in St. Louis, they are licensed as K0HWY and W0EHR respectively. Peewee Hunt, another well-known orchestra leader, operates W8HBC in Columbus, Ohio. W6UK in North Hollywood, Calif., is owned by the noted guitarist Alvino Rey. Among royalty, Crown Prince Feisal and five of his royal relatives are amateurs in Saudi Arabia. Former Archduke Anton of Austria was such an ardent amateur that when the Germans occupied his country just prior to World War II he continued operating in a ham radio contest, surrendering only after the contest was over. He survived the war, incidentally, and now is licensed under the calls OE3AH and OE5AH as plain Anton Hapsburg. And the Maharajah Kumar of Sikkim, P. T. Namgyal, is one of the two amateurs in the remote Himalayan country, with the hotly-sought-after call AC3PT. Relaxing on the Air. Others of the nation's top military men enjoy hamming as a relaxing hobby. Rear Admiral Henry C. Bruton, Director of Naval Communications, has been a ham a long while, as attested to by his "two-letter" call, W4IH. Brig. Gen. Joseph Stilwell, Jr., son of "Vinegar Joe" Stilwell of World War II fame, is licensed as W4FPE. 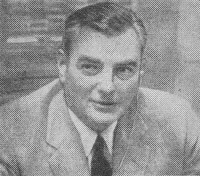 Former Commissioner George E. Sterling, who retired from the Federal Communications Commission in 1954, and previously had served in the Radio Intelligence Division and as Chief Engineer of the FCC, has been an active ham for years, with the calls W3DF and WIAE. A prominent hotel executive, Ernest Henderson, president of the Sheraton Hotel Corporation, operates WIUDY near Boston, Mass. W0HBG is the call assigned to Clyde Hendrix, vice-president of Pillsbury Mills. The City Manager of Superior, Wisconsin, W. R. L. Taylor, hams with the call K9IGF. And there is even a ham who is a professional wrestler - "Flash Gordon" Walker, K4INN.